3pm. It’s arrived. The day you’ve been waiting for as long as you can remember. From growing up, you are not unlike the rest of us who dreamed of being in a situation like this. Looking on behind the ropes and fences for too long, now it’s finally your turn! Embracing this moment is something you are ensured to do. Yes, embrace it but don’t waste it. It’s the biggest game of your life. You must take and use every advantage you get to fall over that finish line as a champion. The Sport-Tek Micropique Sport-Wick Pocket Polo will give you the tools you require to become a deserved winner. It holds all the ingredients of a winner, ensuring you will be at peak condition once you and your team take to the field with your uniforms pulled on, shoulders pulled back and chests sticking out to the screaming supporters. The polo weighs 3.8 ounces and is made from 100% polyester tricot. This polo also has an added bonus as it has a snag resistant feature. There are many benefits from this, such as heat control, moisture management and wind protection, again another reason that allows you to release the shackles and perform to the peak of your ability, to help you and your team be number 1! 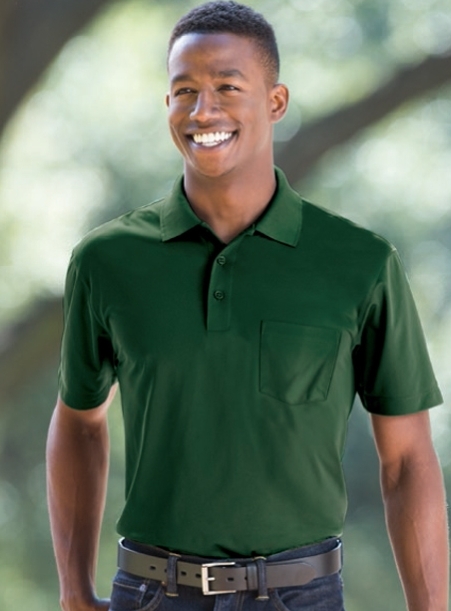 A double-needle stitching effect throughout the polo gives an added protection to the material, so any pulling or dragging won’t affect the performance of the polo shirt. A tag-free label and taped neck not only ensures maximum comfort as there will be no label flapping in the wind, but the taped round neck tucks around your neck to leave a professional look and feel. The 3-button placket fits in nicely with dyed-to-match buttons blending nicely into the colour of the polo. Other features include set-in, open hem sleeves and side vents. The side vents are a major feature as they enable you to work even harder, as your body won’t have any sense of congestion, thus allowing you to perform to the peak of your powers. Adult sizes range from XS-4XL, accommodating any body size and shape. This polo comes in a wide variety of colours, including: Black, Forest Green, Iron Grey, Maroon, True Navy, True Red, True Royal and White. So, don’t take any chances, be the best you can be by adding the Sport-Tek Micropique Sport-Wick Pocket Polo to your set of skills.